Grave robbers used to need special skills to make their living. Indifference to getting their hands dirty was one; a flexible spine for shovelling in the dark was another. A nose and throat which didn’t gag at the smell of rotting flesh was a third. John Witherow (lead image, right) , editor of the Times of London, has displayed some talents for his 37-year long rise in the service of Rupert Murdoch. He’s been so keen on grave robbing that once he didn’t realize the corpse he was lifting and selling in his newspaper was still alive. In that enterprise, Witherow’s accomplice was the Moscow correspondent for the Sunday Times, Mark Franchetti (lead image, left). Their idea was that selling stories about a dead Russian agent was bound to attract paying readers. In January 2005 they tried it with the name of Claudia Wright, who was the Washington correspondent for the New Statesman of London between 1979 and 1986; also my wife. This month Witherow is trying again, promoting a book by his associate editor Ben Macintyre. The corpse this time is different – it’s Michael Foot, the former Labour Party leader; he died in 2010. But Witherow is careless. Macintyre’s new tale gives the lie to the one Witherow and Franchetti dug up about Claudia thirteen years ago. Claudia, they reported then, had tipped off the Soviet KGB to the identity of Oleg Gordievsky, one of the best double-agents the British Secret Service claims to have run against Moscow. Macintyre says the report of the Claudia tip-off was a lie – “a false lead” according to Macintyre’s source at the CIA. The real tipster he now declares was the KGB’s double-agent at the CIA, Aldrich Ames, who told his handler in Washington, the head of KGB counter-intelligence in the US, Victor Cherkashin. Macintyre reports also that Gordievsky, with the benefit of hindsight, says the same thing. Cherkashin published his own book in 2005. “Ames also informed us that Gordievsky agreed to spy for MI6,” according to Cherkashin. “Ames identified Gordievsky in March , the month before he started spying for us.” Like Gordievsky, Cherkashin denied that Claudia had been the tipster. 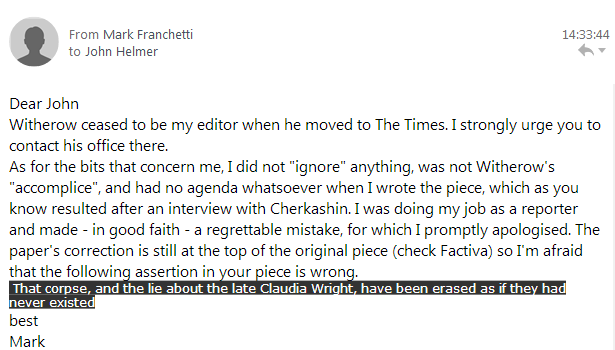 Witherow and Franchetti ignored what both of them said, then turned their saying it upside down so that they became the Times’s sources for “speculation” about Claudia. Cherkashin’s book concluded this was “little more than intelligence games. Their connection to real issues of national security…was often peripheral…during the last years of the Cold War, intelligence became a game of penetrating the adversary’s service. It was expensive and superfluous.” Unless you are selling the game to gullible readers. Gordievsky’s story has been told so many times before, including by himself, the retelling ought to put a value on the intelligence he gathered for the KGB, and also the intelligence he relayed to MI6. Macintyre doesn’t do either. The intelligence Gordievsky gave the British consisted, as Cherkashin had already confirmed, of the names, aliases, and methods of his KGB colleagues. Gordievsky, Macintyre claims, was an ideologue: he “was undermining a political regime he reviled”. There’s no evidence his espionage for the British achieved anything of the sort. Everybody he exposed was replaceable, and was replaced. 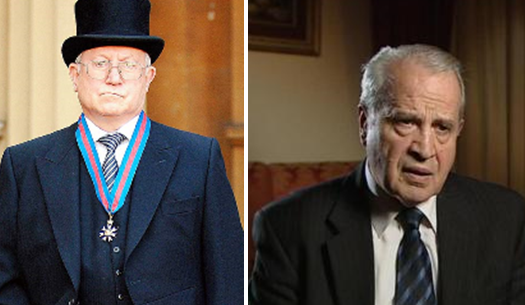 Left: Gordievsky at Buckingham Palace in October 2007 to receive from the Queen the medal of Companion of the Order of St. Michael and St. George (CMG). Right: Victor Cherkashin in Moscow in 2005. 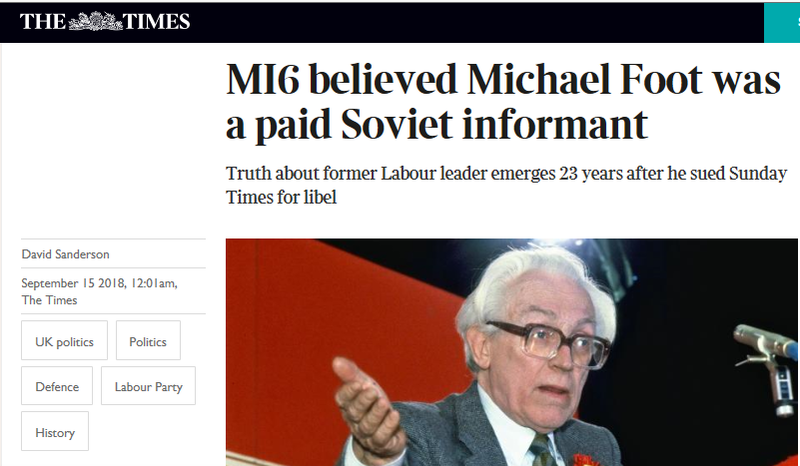 In the case of Gordievsky’s reading of the KGB’s Michael Foot file, he confirmed for Macintyre that Foot “leaked no state secrets…had not broken the law. He was not a Soviet spy. He had not betrayed his country. But he had taken direction and secretly accepted money from, while providing information to, an enemy power…” The evidence for the money, £1,500 over twenty years, is still no better than Gordievsky’s say-so; it is based on what he says he told his British handlers that he had read in the KGB residency’s files in London, and what he repeated to Macintyre recently. That those files contained nothing Gordievsky could remember on Conservative Party politicians, ministry officials, business moguls, or military officers, and that the only British figures Gordievsky has recalled were communists, socialists, or Labourites is ground for suspicion that Gordievsky’s memory is an ideological sieve. Like Macintyre’s, Witherow’s, and Murdoch’s. In July 1995, Gordievsky’s say-so wasn’t good enough for Witherow to defend in a London libel court his published allegation that Foot had been a KGB spy. 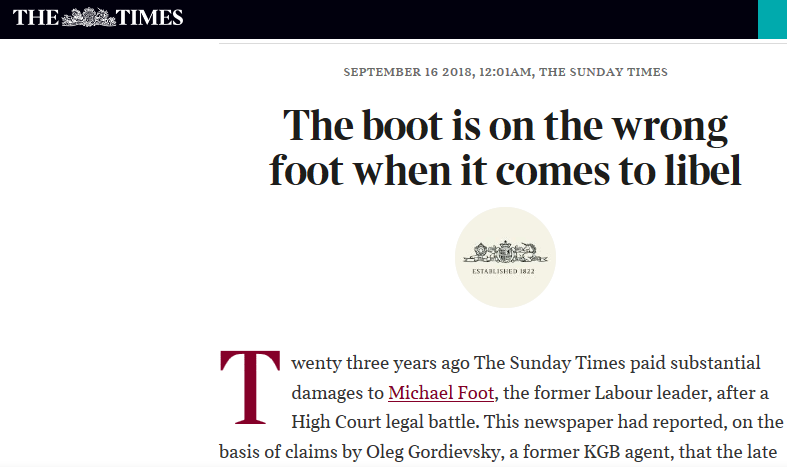 Murdoch ordered both the Sunday Times and News of the World to publish a retraction and pay Foot compensation of more than £135,000 for the story headlined: “KGB: Michael Foot was our agent”. Witherow’s defence of what he had printed was that the allegation that Foot was an agent might have been “utter rubbish”, but his newspaper was reporting no more than that the KGB believed he was an agent. He didn’t risk this line of defence in court. Witherow was forced into retracting and paying damages when Foot’s lawyers convinced the presiding judge that Murdoch himself should be called to testify. “”If [Murdoch] owns newspapers which can make accusations of this nature, he should appear in court when they are raised,” Foot’s lawyer told the court, defeating the attempt by Murdoch’s lawyers to keep their man out of the box. Franchetti and Witherow thought they were safe from having to substantiate their speculation in another High Court libel suit. Wright, they reported in the Sunday paper, “who worked in Washington in 1985…died of Alzheimer’s Disease 10 years ago .” On the Monday the Times repeated the death, but moved it back to 1991. The two Murdoch papers were asked to publish retractions in the print editions, and remove the internet versions of the articles permanently. They were also asked to “make a total donation of seventy thousand British pounds (GBP70,000) to the Claudia Wright Appeal for Alzheimer’s Disease Research, a registered public charity in the State of Victoria, now 15 years old, which is administered by the Mental Health Research Institute of Victoria, in Melbourne and which is associated with the Royal Melbourne Hospital.” The date was January 14, 2005. Witherow and Robert Thomson, another lifetime employee of Murdoch’s, ordered their lawyers, reporters and editors to do as little as possible. On January 15, the Sunday Times printed a correction notice. This said Franchetti had “wrongly stated that Claudia Wright, an Australian journalist, had died in 1991. In fact, Miss Wright is still alive, although gravely ill. We regret this error and apologise to Miss Wright and her family for any distress caused.” To the end of the internet version of the Times’s story, the same words were added, except they were headed with a misspelling, “corretion”. The spy libel continued. Witherow was calculating that if he delayed and was lucky, the grave illness which the lawyers had also confirmed, would kill Claudia before the libel case could reach the court. On January 29 she died. In British and Australian law the dead cannot sue for libel. Instead, on February 14, 2005, I filed against the Sunday Times and the Times at the Press Complaints Commission (PCC) . Then the UK press watchdog, the PCC was funded by a levy on the media it supervised with what it called its Editors’ Code of Practice. 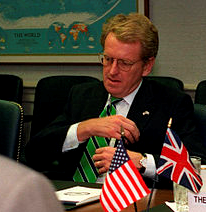 The chairman of the PCC at the time was Sir Christopher Meyer (right). 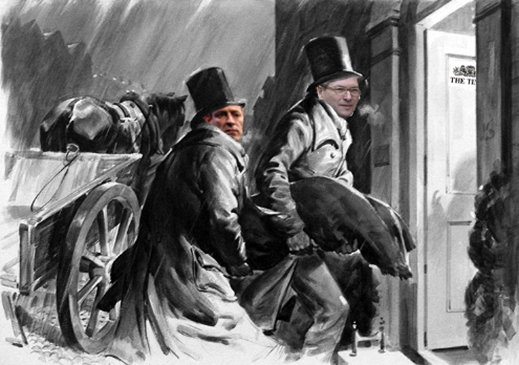 He had taken the PCC job after returning from Washington where he was the British Ambassador. Trained to speak Russian, Meyer had done a tour in Moscow as personal secretary to the Ambassador; directed the Soviet section of the Foreign Office in the 1970s; and then moved to the Moscow embassy as head of the political section between 1982 and 1984. Copies of the judgement were mailed to lawyers in London, and by email to me in Moscow. Then it disappeared. No trace of the document can be found in the PCC archive of cases. That corpse, and the lie about the late Claudia Wright, have been erased as if they had never existed. That’s not the same thing as burying the lie and reviving the truth.